For years the stadium occupied by Broń Radom was the multi-use one in town, while derby rivals Radomiak had the football-specific ground. This didn’t change after complete reconstruction from 2010-2012, when a brand new structure was created in Broń’s home. Two nearly identical stands (with a separate modest away section) offer 4,066 places for spectators and a vast infrastructure for athletic training, including covered running track. Eastern plaza (previously training courts) was converted into a representative square sued as ice rink in winter. The entire project consumed PLN 30 million (€7m) and a third of it was covered with EU funds. Despite the multi-sport infrastructure, every-day event use is primarily football by Broń, whose fanatics have one standing section reserved for them. Ironically that section is not compatible with strict legislation introduced in 2009. Located in the north of Śrem, the stadium stands at the heart of the town’s sports complex. Two landfill stands hold roughly 3,000 people. Western sections are double-sided, which means there’s also room for spectators towards the training field. This leisure complex also includes a hotel, tennic courts and smaller playing fields. It’s commonly known simply as Stadion Polaru, nicknamed after the home appliance manufacturer Polar, next to whose factory in north-eastern Wrocław the stadium was built. It was inaugurated in 1975 and since then retained its shape with one landfill stand. It used to accommodate 1,800 people in its heyday, but even after Polar won promotion to the central level of Polish league system attendances rarely went close to 50%, even when Polar reached Polish Cup quarterfinal in 2003. Since 2004 the stadium was no longer in line with upgraded regulations, forcing the club to move. Today it’s again used by Polar (which folded in 2006 and was re-established as an amateur team), but now part of the city’s Municipal Sports Center. Current operator allows 300 people inside. The stadium is part of a large sports complex in the border town of Bogatynia. 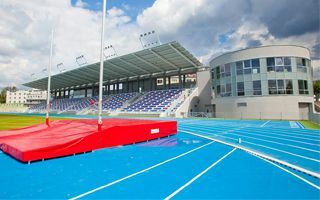 There’s a training field, several tennis courts, basketball field and a hotel for 50+ sportsmen – all of these facilities flank the stadium from the north and east. The stands have a simple division: very modest covered one stands in the south, while the long northern one holds most people in the north. The running track has 4 lanes with 8 lanes for sprint. Located nearly at the heart of town, the municipal stadium in Kamień Pomorski has one concrete stand with facilities underneath. In clear need of investment, the stand offers roughly 900 places for fans, according to the municipality. A new training field was built with synthetic grass and 300 seats just north of the stadium. This modest, but charmingly located multi-use stadium lies just meters away from the Puck Bay waters, surrounded by trees. Its small steel stands were renovated in 2009, receiving seats. Built in 2012, the new stadium in Działoszyce retains, but adapts the old club building. Along with concert stage and some benches it occupied the north end of the stadium. The south side received a new grandstand with 450 seats, a third of which is covered. Interestingly, the stadium’s new athletics track is large enough to allow incorporation of basketball and volleyball courts behind each goal. On the west side also a parking site was created to serve the stadium.